The product that got me into this Milk Makeup obsession is definitely the Sunshine Skin Tint SPF 30. For those of you who love Glossier Skin Tint, I believe this is something you will enjoy too. Similar texture, with just a little bit more coverage. It’s dewy, fresh and glowy — the glass skin finish (in a more natural way). I have pretty dry skin, and this sits on my skin quite well, no dry patch grabbing situation happening if that’s your concern too. The next product I really enjoyed is the Kush Lip Glaze. 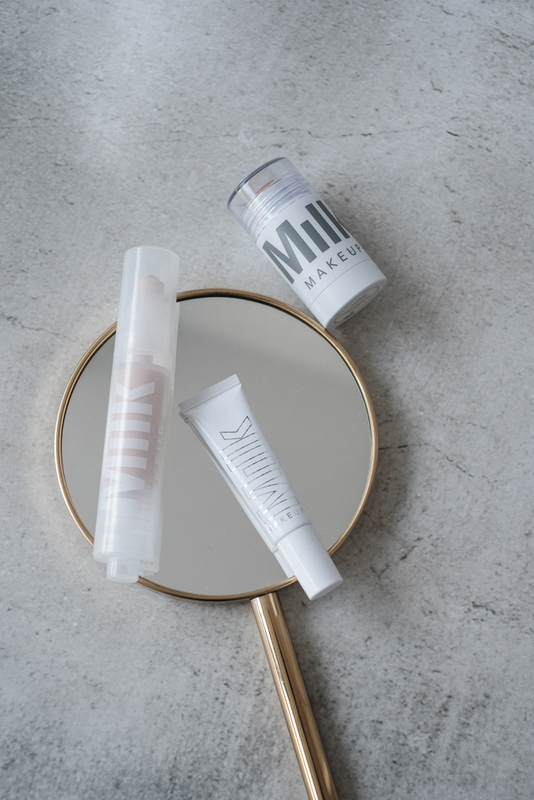 Like all the other Milk Makeup products, the Lip Glaze is 100% vegan and cruelty-free. With jojoba oil and olive oil, it softens your lips while moisturising your lips. The texture is quite unique too, somewhere between a gel and a liquid, but not tacky at all. Designed to be used as an overnight lip mask, but I also love using it during the day whenever I feel like my lips needed some extra love. To me, what Milk Makeup really stand out is in there stick complexion products. I didn’t try their famous lip + cheek tube, because I’m not a big blush person. However, I did pick up the Matte Bronzer (in Bake), which is equally loved in the online world, if not more. It blends seamlessly and stays all day. I know it’s named as a matte product, but I do feel like it comes with a natural glow. Which serves both the purpose of contouring & bronzing. I’d say if you’re only looking to try one product from Mil, this will be it. Of course, not every product is meant for everyone. 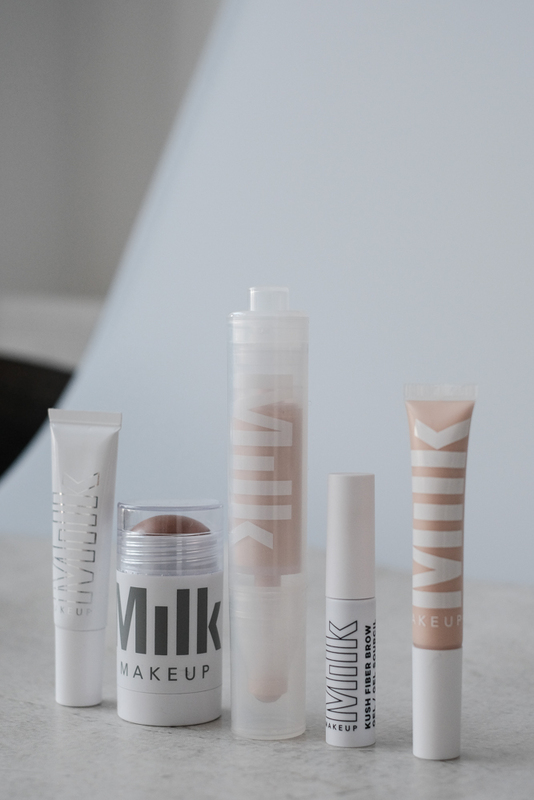 I have to say, I’m pretty impressed by the overall standard of Milk Makeup and quite satisfied with most of my purchases. But there are a few things I’m just not so crazy about — meaning I have other stuff in my own collection I would instead use. The first thing I’m on the fence is about is the Flex Concealer. Shocking! I know, since every review I’ve read since to rave about it. It’s not bad, it covers, and it stays, but every time I use it, I instantly feel like I should have stuck with my other concealers. I personally prefer a more brightening & glowy concealer, perhaps that’s the reason. There are a few things I consider essential to get my day to day life going. Books, my planner, sunscreen, lip balm, and of course, my daily dose of tea. I use to drink chamomile tea religiously, then there was a moment I was obsessed with earl grey, and now I’ve moved on to something more oriental. Being a long-term fan of Grassphere Tea Shop, I was so excited to have been given the chance to try their latest Kampo Tea pack. And now, I’ve finally got to sit down a give u guys a full review. I tend to avoid any sorts of refined sugar in my drink (for the sake of a clear skin), but when it comes to brown sugar….sorry I’m all in. Perhaps my favourite from the entire pack, I literally cannot sipping my cup, even though elegantly drinking your tea is kind of a thing. All that said, this particular blend is good for your eyes, especially beneficial for this who spends a lot of time staring at their screen everyday (don’t we all??). I personally love drinking this in the evening, sinking in my couch, enjoying the beautiful smell of brown sugar (I’m bias here, but everything else smells amazing too! ), listening to my favourite podcast and just letting my eyes rest a while. A similar version from the previous one, the Brown Sugar Jujube Black Tea is a simpler taste, but equally delicious & beneficial. Self care can mean different things for different people. For me, pour little cup of this before my crazy day start does the quite the magic. p.s - its good for your skin too!. Something slightly more refreshing from the previous one. I’d like to consider this my day-time tea choice. Due to the ingredients, this particular tea blend is filled with vitamin C, giving us a quick health boost. It is also great when you’re filling a little off (you know that annoying low energy filling when you are about to catch a flu? we’ve all been there!). To me, lime is something that grows on you with age, I remember being a kid/teenager when I avoid all things in the lime/lemon family. And now, as I’m older, I’m starting really appreciate it. The tingly sourness along with a kick from ginger, such a great way to bring your energy back! Though I personally don’t like any dish that contains ginger, I don’t mind them in my drink. I’m a huge fan of ginger tea, they make me feel calmer & warmer, especially during colder days. With the mellow taste from carefully handpicked Taiwanese black tea, the spicy taste of ginger taste just about right. Like all the other blends it doesn’t just taste nice, this specific Ginger Black Tea, is great for your circulation and enhancing blood flow. I love drinking them the next morning from a huge & tasty dinner with friends, makes me feel less bloated from all the rich dishes the night before. Something similar from the previous one, but more in favour to my taste buds, and perhaps my best friend during the time of the month. I get a lot of period bloat for those day, but a large mug of Brown Sugar Ginger Tea literally makes feel better in a few mintues. What can I say? Happy gut, happy period life! If I’m honest, I’ve never tried Roselle Tea (also known as Hibiscus) until this days. I know about the health benefits, such as blood health, lesser chance for skin irritations and cancer etc. But the smell was too sour for me, so I never thought of trying it. But thank god I did this time, perhaps its the brown sugar and the rose, it wasn’t as sour as I thought it would be, in fact it was quite refreshing and thirst relieving. I dig. What I love most about the Kampo Tea Pack, is not just simply the flavours, but the fact that everything is sourced and made in Taiwan. 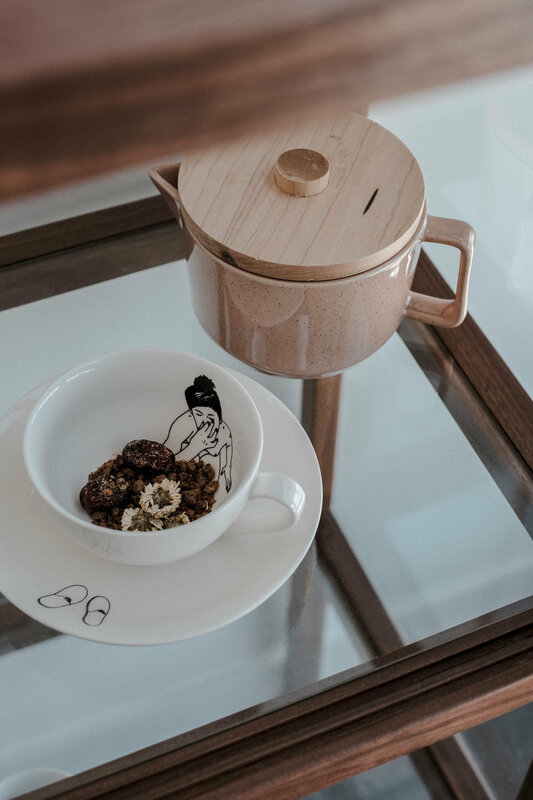 For instance, the brown sugar is from Tainan, the ginger found in Taitung, the red jujubes planted in Maioli, and the tea shop itself is based in Taipei. I love supporting brands from home, despite spending almost 10 years abroad, I’m still the Taiwanese kid at heart. And Grassphere Tea Shop is one of the many brands I keep close in my heart, because they remind me how amazing home is. There you have it, my thoughts on Grassphere Tea Shop’s latest Kampo Tea Pack. Do any of the flavours sound interesting to you? Let me know your thoughts, I’d love to know! About a year ago, I made the jump to change my entire shooting system from Canon to Fujifilm. And for me, it’s probably the best decision I’ve ever made in for my photography journey. I have been looking to simplify my shooting process for so long. To let me mind lead rather than getting wrapped up in the vortex of equipment. Of course, how good your photograph is, is not determined by how updated/expensive your camera is. All that said, despite me getting so many DMs about my gear, this is still just me saying the Fuji system works for me best and sharing my experience. And hope you guys find it somewhat useful! Personal Travels, Most Social Media Content. Anything that needs accessibility and ease. Honestly, if you want a camera that doesn’t need interchangeable lenses, small to take with you everywhere, or just a simple travel camera - look in to the x100 range. They have amazing image quality and for the price you’re are paying for - it’s 100% worth it! They preform well in low light too. You can’t change lenses with this one, and 23mm can be too far for some circumstances. Personally, I’ve been shooting fix lens mostly for my entire life, so I’m quite use too moving around, but do bare this in mind. Client shoots, Editorials, Products Shoots, Collaborative Blog Posts/Social Media Posts, Fashion Week, Prints etc. When I’m out and about for a normal day shooting everyday life. Or when I’m not travelling for work. After renting a Fujifilm for a month, I’m fully converted. I really didn’t want to go back to my large DSLR cameras. This one is in mid-frame, and it’s perfect for my size - creating perfect imagery without making your arms sore too much (they still sore till the end of the day, but not as much as my old Canon). Though it’s considered small for most mid-frames but it can still get in the way. But like I said, I use this one for work, so I would obviously have my big backpack with me. Again, not as travel-friendly as the x100 ranges. I use photoshop for detail editing. Getting rid of finger prints, when there is a random pedestrian on my street shots anything that’s sort of bothering me in the image. Perhaps my favourite part of editing. Experimenting on contrast/saturation/ exposure/crop/clarity/details and etc. To me, this is the software to really bring out your personal style, because everyone sees a raw image differently. I normally only use photos taken by my phone for stories. A6 is my favourite filter, and perhaps the only filter I use. I like to bring it down so it doesn’t look to fake. I only use it for the vintage grain effects I’m currently obsessed with. During my two years in London, the one thing that surprised me the most was the number of royal gardens (there are actually 8 different ones in London!) you can find in the city, even just huge gardens & parks in general. I lived in Canary Wharf, a relatively new business district with a lot of high-rise building. Despite all that, you can always catch the freshness of trees, flowers and gardens on the street. This is perhaps my favourite thing about the British capital. And thanks to Miller Harris, I get to relive those memories - through their Forage collection. There are three different scents in this particular collection (Lost in the City, Hidden on the Rooftops & Wander through the Parks). And I'm sharing Lost in the City with you today, inspired by urban ferns. When I heard about the idea behind this perfume, I thought it would smell more botanical. However, the first scent that I picked up was actually rose scent. Which is odd, since rose petals are their heart note rather than the top. It caught me off guard, but in a good way. Along with early grey, black currant, amber & musk, blending into a subtle feminine scent with a nice sharp of rose. To be honest, I never thought I'd be sharing perfume with such a significant rose note (I use to think it's too girly or sweet for me). And yet now I'm reaching for it a lot more often than expected. I only started appreciating roses after I started taking photos. It's pretty hard to imagine, since visiting the local florist for white roses is now a huge part of my weekly routine. Even so, flowers haven't worked their way to my perfume collection much before. I tend to go for wood and tea scents. To me, they are so refreshing, and I love how they just wear off in a nice organic way. I was never the girl who would ask for a rose scent in a perfume shop back then. Well, not until now. I've found my favourite floral formula, finally. My very feeling for Miller Harris' Lost in the City inspired me to plan these images without too much flower. Being so different from all other rose perfumes, I think this is the only way to do it justice. Cheers. For the longest time I remember, I never had a specific routine when it comes to body care. Comparing to my obsession with skincare, I'm the lazy gal in this area. The most I do is probably finding new products when I ran out of them. It's quite the opposite to the way I take care of my face and hair. Which is weird in a way, because any parts of your body should deserve the same amount of care & love. All that said, I received the new body wash and lotion duo of Miller Harris last month. And it's safe to say it's one of those few body care products that got me excited after my first try. Let me tell you why, keep scrolling! If there's one thing I missed the most about London, it's the unlimited choices of afternoon teas. And perhaps thats why I'm so fond of Miller Harris' tea tonique line. Inspired by the classic early grey tea (my favourite black tea! ), both the body wash & lotion comes with a enjoyable scent of lemon, roast tea leaves and bergamot - a tea lover's dream come true. I'm not the biggest expert of body washes. As long as its not too harsh or drying, and the scent works for both day & night, then I'm good. Though if I'm honest, it's quite hard find something like this. The tea tonique body wash is one of those rare ones that ticked both boxes. The gel texture doesn't create a lot of foam, which I personally prefer since my skin is sensitive. You get two moisturiser choices in this collection. Because Melbourne is quite dry, I went for the richer version. The body cream is rich in argan oil and shea butter, and I love how it leaves my skin so soft and silky (bye bye dry patches!). I was never good at applying lotion daily, but this particular product actually got me doing so actively. Along with the body wash, the scent lasted pretty long, works like a subtle fragrance. Not exactly body care, but I can't finish this post without introducing my favourite Miller Harris scent at the moment. For someone who doesn't drink coffee, tea has always been my best friend. I make myself a cup of tea everyday, without fail. All things considered, I'm sure you can imagine my excitement when I found out there's a tea scent perfume out there. Perfect for everyday, the Tea Tonique Eau de Parfum makes me feel so elegant. It's refreshing, a little bit woody, and just uplifting enough to start the day. I personally think perfume and scents are quite magical, since one tiny spritz can easily change how we feel about ourselves. That's why my perfume cabinet is filling up so fast, and I don't mind. There you have it, the Tea Tonique trio I've been loving for the past month. Which one of them are you guys interested in? Or share any of your favourite body care products. Hey guys, since I get quite a lot of questions about my Instagram photos, I thought it would be cool to write a post about it. I used to stick with shots taken from my camera only. I would edit them on my MacBook before uploading them to my iPhone. Which takes almost forever. Not that I don't do this anymore, but recently I've discovered these external phone lenses from Bomgogo and made everything so much easier. Now, I don't have to bring my camera with me for a simple walk by the river or a day trip, and still be happy with the shots I took. So without further ado, let me introduce you to my new iPhone lens kit. Perhaps my favourite of them all. The super slim star lens filter makes your sunset photos so much prettier. You can either use it with the wide angle kit or attached in on your camera. It's literally the best. Face your phone towards the sunlight (or any sort of light source), and you get these beautiful sparkling lights in your shots. You guys know I love my moody shots, but sometimes even Adobe can't help if there's too much sunlight! So, if you're in a beautiful street, and yet the weather is just TOO good...it's time to bring out your NDB filter then. I was also told that it's great for taking moving cars, though I personally did not see too much effect in that (perhaps the Melbourne cars are just not that fast), it's still a great filter to bring out exposure and highlight! What I love about the CPL lens is that it really helps with reflections. Instead of saying it reduced them, I'd like to say they make them look better. Everything looks richer, and if you're like me, you will stop feeling irritated and annoyed about your window shots. See what I mean there? It really brings out the green & blues of these glass windows from Rosetta. note: all these photos above are taken with the filter mentioned & the wide angle lens. During my entire month of testing, I did not use these colour filters as much as I use the previous lenses I've mentioned. Don't get me wrong, I love how they turned out, but if you've seen my photos, I'm sure you will realise I'm not a fan of having a single vibrant colour in my photos. However, I do have a way working them around. For instance, the blue for bluer sky and water, the grey for a nice vintage fade look, and of course, the orange & red for sunsets. And they turned out pretty cool! Honestly, I know this kit is originally designed for travelling, but I'll probably still choose my camera over this. For someone who's been used to the weight, I'm happy to bring my Fujifilm camera around while exploring. However, it is surely a great set of lenses for a simple day trip & casual weekend out, with other filters you can get amazing outcomes, I reckon is good enough for social media, if not more. I had my doubts at first, and yet it did perform better than expected. If I had to be picky, I have to say it's not the best choice for you iPhone X users, somehow they did not work well. I'll keep trying though and keep you guy updated! All that said, if you're looking to upgrade your phone photos without carrying a bulking camera, Bomgogo got you covered!